One year when I had more tree saplings from the State Nursery than I could plant, I tossed them in pots and set them in this area with lots of mulch around them, intending to plant them out the next year. 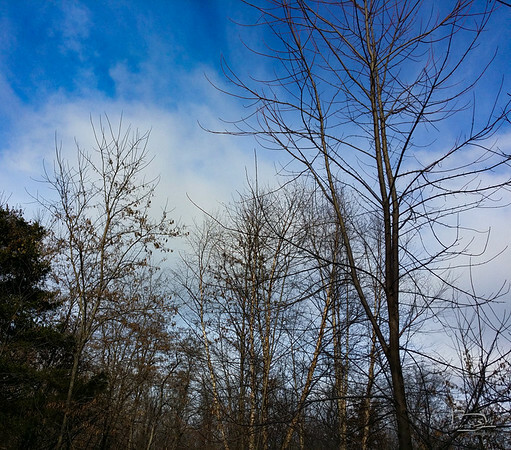 The years slipped by and they grew: River Birch, Osage Orange, white pine and some others. Perhaps a bit of crowding going on here as mulberry comes up right next to this triplet of river birch. 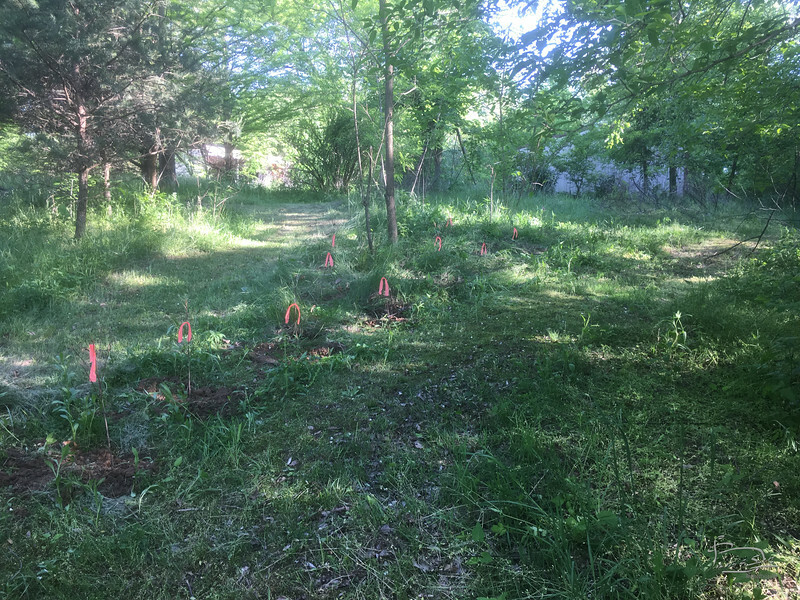 This grove is the result of heeling in a bunch of trees that I didn't have time to place out where I thought I wanted them. All of a sudden years passed and the osage orange drops a bunch of hedge apples, the river birches stand tall and proud, but a couple of white pines are really struggling underneath. So this is considered a pest and invasive. Does seem to be in lots of places, just like most of the other forest herbacious layer plants. 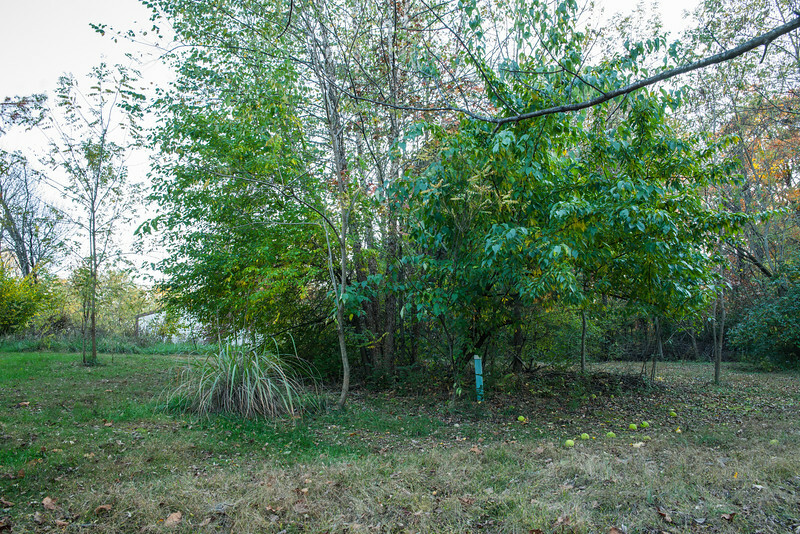 On the north side of the osage orange, an area that is usually very shaded. 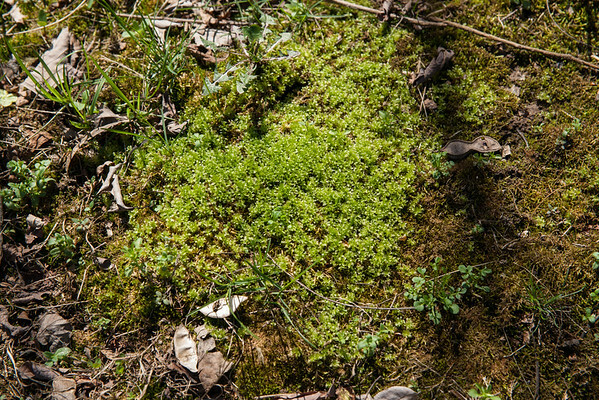 Looks as if it is the moss blooming. Checking back to see how direct application of 18% round up is working. I had injected a cc or so directly into the soft stem on a couple of these, and it is having an effect a day later. 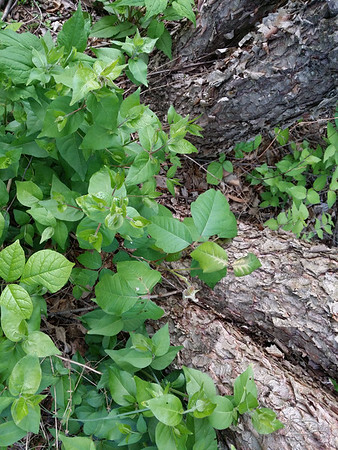 I also did the poison ivy behind them, poking up between the trees, and it doesn't look too happy either, leaf discoloration. However, it hasn't killed it, yet. Checking back to see how direct application of 18% round up is working. I had injected a cc or so directly into the soft stem on a couple of these, and it is having an effect a day later. 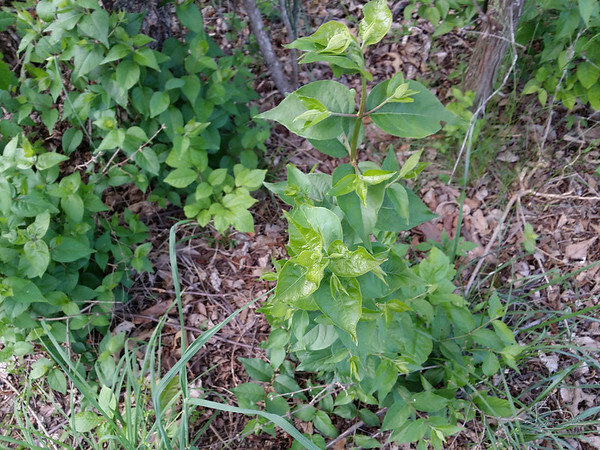 I also did the poison ivy behind them, poking up between the trees, and it doesn't look too happy either, leaf discoloration. Shriveled up a bit, but it recovered fully. Checking back to see how direct application of 18% round up is working. I had injected a cc or so directly into the soft stem on a couple of these, and it is having an effect a day later. 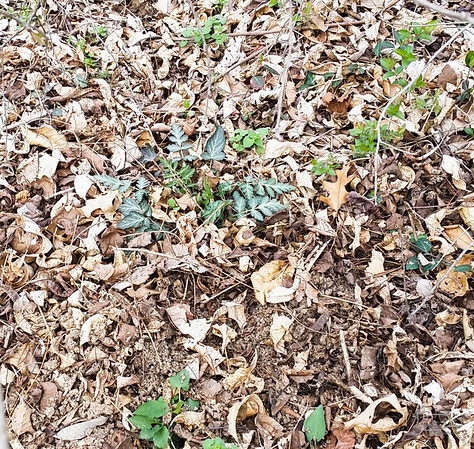 I also did the poison ivy behind them, poking up between the trees, and it doesn't look too happy either, leaf discoloration. But that didn't do the job. In this image, it looks like a branch with seed pods hanging off it. The other images were to check on leaf shape, branching, thorns and so forth. There's a big osage orange behind that has lots of "oranges." This one in front doesn't have any yet, and I noticed seed pods in there. 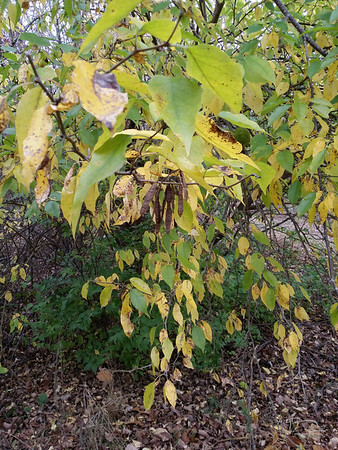 I checked the leaves and branching and trunk bark -- but osage orange doesn't have seed pods. Finally, it dawned on me, after realizing that the seed pods are the same size, shape and bundling as black locust that maybe a twig of those had fallen into the tree and landed on a branch so that it looked like it was part of the tree. I went back and sure enough, that's what it was. Now that I know what I'm looking at, it's easier to see that this is not part of this tree. The branching pattern is of the new growth in the twigs. Pairs of new twigs sprout on opposite sides of the parent branch or they alternate with some distance between them. This is not always that easy to see since most of the time one or the other side of a pair of young twigs grows much more than the other. Often one side or the other will come off for some reason before it gets much more than a few months old. Trees have several families of preferred shapes. The black locust grows really fast by sending out quite long new growth and likes to shoot straight up in a small zig zag manner to a crown that has a spread out sprawly look, poking up from a somewhat wider middle section. The river birches are almost like columns, a central trunk (or group of trunks) going straight up or gently curved up with a crown of much shorter twigs and a more compact top than the black locust. The bald cypress like to grow into a pyramidal shape, with a pointed narrow top and spreading out from there down to the ground. 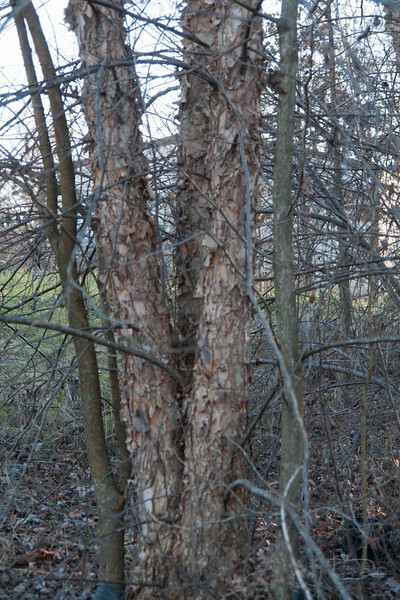 It produces lots of new twig growth every year, but within a few months, many of them have dropped off, giving the leafless winter version a kind of scrawny look, but still a distinct top of the tree and the outline of the pyramid. 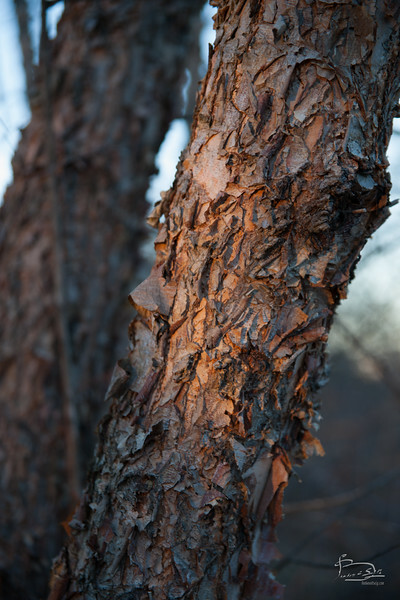 Unlike the birch that grow further north, the river birch has what appears to be flaking bark rather than sheets. 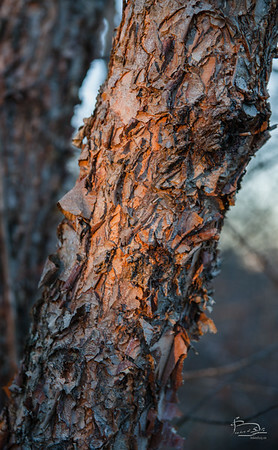 The bark does come off in sheets, but very thin and usually only a few square inches. There is a fair amount of resin in these bark flakes, enough to catch fire even on a damp day. 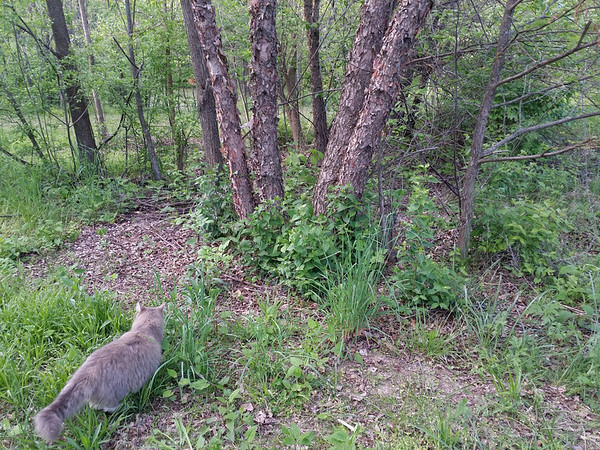 I could see a lot of little birds flitting around in the brush, but can't see any of them in the photo. they were moving quite quickly and short distances. Cut down the big bush honeysuckles around the swing cedar and cleared them out. Some were quite large and I collected the larger ones and laid them out to consider what could be done with these very curvy stems. on either side of the path from the garden toward the woods. 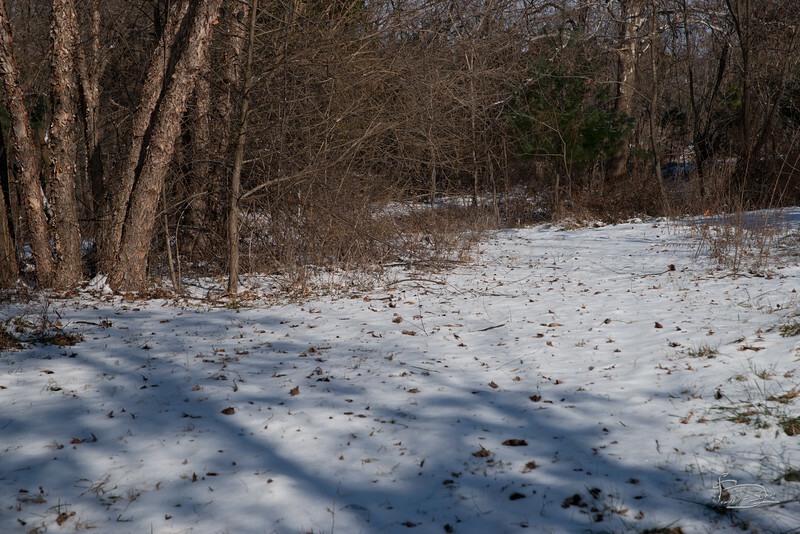 The path crossing is the one between the kitchen garden and the forest edge and the upper pond area. On the right is 7.5RiverBirchHedgeAppleGrove and on the left is 8.1swingCedar. 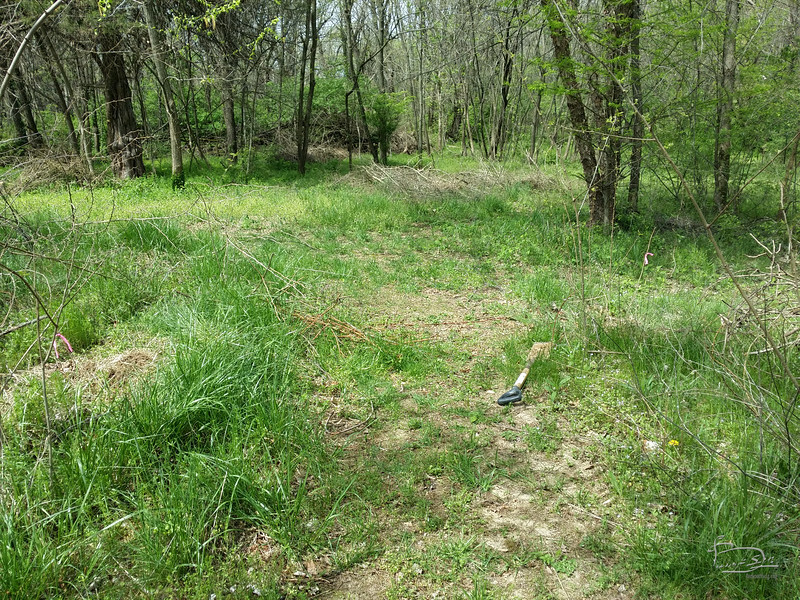 I will want some kind of gate or maze here to discourage deer travel into the kitchen garden. Deer to the right, humans to the left. Food for people to the left, for the deer to the right. Good couple hours with chain saw, clippers and a lot of shifting things around to work on them. Managed to avoid the thorns -- this is an osage orange and they do have vicious thorns if you are careless. Branches hauled up to use in the permaculture berms. 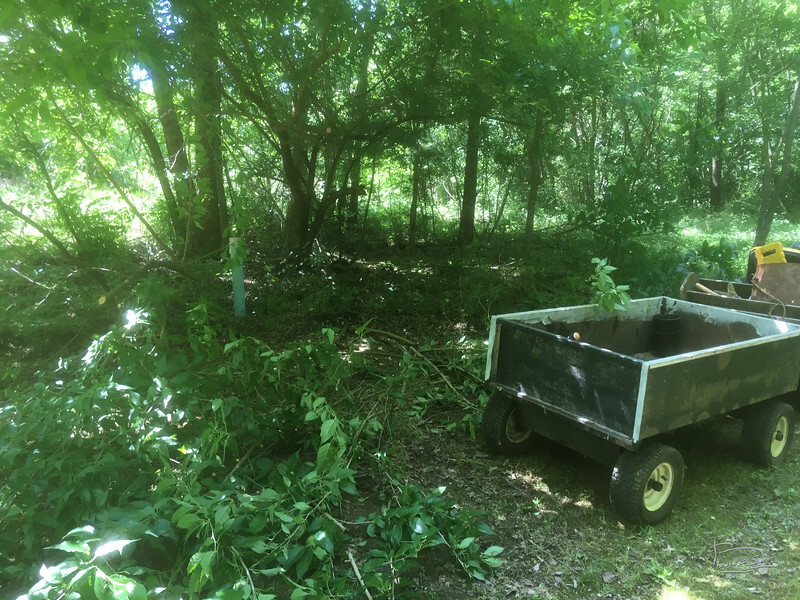 Included a prelminary bush honeysuckle and multiflora rose sapling removal. Also some poison ivy. Not all in this grove, though, still need to get the south half and clean up the river birches.